SABIC Vice Chairman and CEO Yousef Al-Benyan again gathered the world’s attention on SABIC during the Hongqiao International Economic and Trade Forum (HIETF), a key thought leadership session of the inaugural and historic China International Import Expo (CIIE) in Shanghai, as he illuminated SABIC’s commitment and strength as a growth partner in China’s journey of reform and opening up in the new era. And speaking as a panelist at HIETF on the forum theme of ‘spurring new vitality of global trade, creating an open and win-win scenario’, Mr. Al-Benyan also impressed the audience with SABIC’s firm standing on the open future of the world. “We embrace globalization, free trade, more openness & connectivity and collaboration between countries & regions, which have all been highly reiterated and bolstered here at CIIE, a special and much-needed exhibition of our time,” he stated. As the world’s first trade fair focused solely on importing, the CIIE is a significant move for China to push forward a new round of in depth opening up to the world. 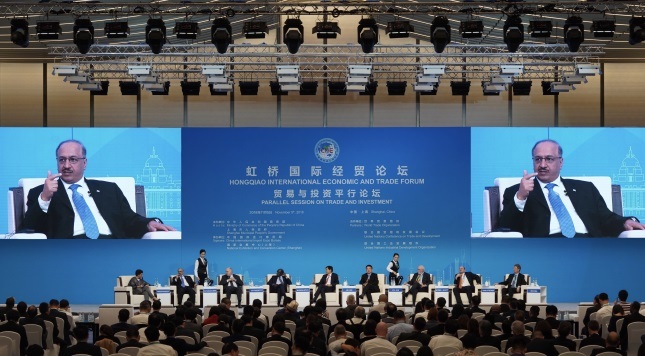 HIETF, the conference function of CIIE, gathered prominent global government officials and business leaders to present ‘China Solutions’ and exchange ideas facilitating globalization and open trade. SABIC’s active participation in CIIE through its thought leadership engagement at HIETF, clearly underlines the company’s strengthening commitment to the China market and to being a global trade enabler. SABIC has been enabling China’s market and visions for over 40 years. Its continually expanded footprint, was recently marked by an investment MOU for a mega petrochemical project in China’s Fujian Province. Today, the company operates in 14 strategic markets across China, a SABIC Technology Center in Shanghai, plants in Shanghai, Guangzhou and Chongqing, as well as joint venture SSTPC with Sinopec running a world-class petrochemical complex in Tianjin, supporting China’s inclusive growth at full speed.